One of the best-selling sandwich cookies, Oreo made its foray into Pakistan in 2014, bringing the delicious goodness to more people around the world. The brand used Facebook ads to design a successful digital campaign which was named ‘Storeo’. 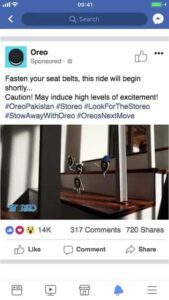 Oreo wanted to increase brand awareness and encourage people in Pakistan to try its cream biscuits and develop loyalty to the brand. So, what was the successful strategy behind Oreo’s success? Well, let’s find out! The cookie brand used Facebook as their main digital medium to connect to its target audience. The Storeo digital campaign included animated videos, featuring moments of childlike delight. Oreo used storytelling with a digital twist. The brand crafted a 5-episode animated video series of 4 stowaway Oreo cookies embarking on an adventurous journey to a boy’s lunchbox. The brand targeted the entertaining video ads to its 13-40-year old audiences using core audience targeting and focused on maximizing views and reaching children and mothers. This creative and exciting storytelling resulted in building anticipation for every episode, holding the attention of the target audience and strengthening brand resonance. In addition, Oreo designed teaser ads for the campaign using photo ads in a carousel format, featuring key still moments from every upcoming episode, and creating hype around the campaign. Here is one such example. Moreover, to maximize reach, Oreo applied automatic placements to run the campaign across Facebook, Instagram and Audience Network. Oreo Pakistan achieved a 5% increase in sales in the sandwich cookie category and 21% increase in trial score. The Storeo campaign ran for a month. Here are it’s results. The brand was effective in reaching its target audience and increasing brand awareness. The Oreo campaign was a success and Oreo proved to one smart cookie!